Who owns your DNA test results? So… you’ve spent a ton of money on your DNA tests — YDNA,1 mtDNA2 and even the new autosomal DNA (atDNA)3 — and you’ve been waiting with bated breath for the results to arrive. You step off a curb on your way home from work and — pow! — a bus comes around a corner and you end up toast. Who, pray tell, now owns your DNA test results? Change the fact pattern a little. You’ve tried and tried and tried to convince that one remaining cousin of your grandfather’s to do a DNA test for genealogical purposes. You finally get the guy to agree, you pay for the test, the kit gets sent in… and a bus comes around a corner while the guy is on the way to the supermarket. Who, pray tell, now owns his DNA test results? Change the fact pattern yet again. A very elderly third cousin had a YDNA test done some years ago and there’s still a vial good for further testing in storage. You agree to pay for the use of that vial for an autosomal DNA test… and just before the cousin gives FTDNA the go-ahead, a bus comes around a corner and careens out of control into his senior citizen center. Who, pray tell, now owns his stored DNA? Who, if anybody, can order an additional DNA test and get the results? This isn’t the same question as who owns your or your cousins’ DNA. That’s a much more complicated legal question and we’ll talk about that another time. This is the very simple question as to who can get the testing company to cough up your or your cousin’s DNA results right now, and who has the right to order additional tests with any DNA sample you may have banked with the testing company. The answer, at least if you’ve tested with Family Tree DNA, is very simple: the person is the one you say should get the results and have the right to order more tests. And if you’re an FTDNA customer,4 you should make that choice right now. On the myFTDNA page that first appears after a log-in, there’s a drop down menu at the top. One option is My Account. And one of the choices under My Account is Beneficiary Information. Choosing that opens up a box where you enter the name, telephone number and email address of the person you choose. The myFTDNA – Beneficiary Information page is where you may enter and update the information of your kit’s beneficiary. The beneficiary will gain complete control of the kit and will be authorized to order additional tests with any DNA that may remain in stock. “Complete control of the kit” includes the stored DNA, the DNA results and the FTDNA account itself. A nice feature is that once you’ve saved your beneficiary information, you can click a link to get a printable copy of a form, already filled out with the key information, that you can then get notarized and keep with your will and other important public papers. And, of course, you should absolutely give a copy of the document to your beneficiary in case it’s ever needed. 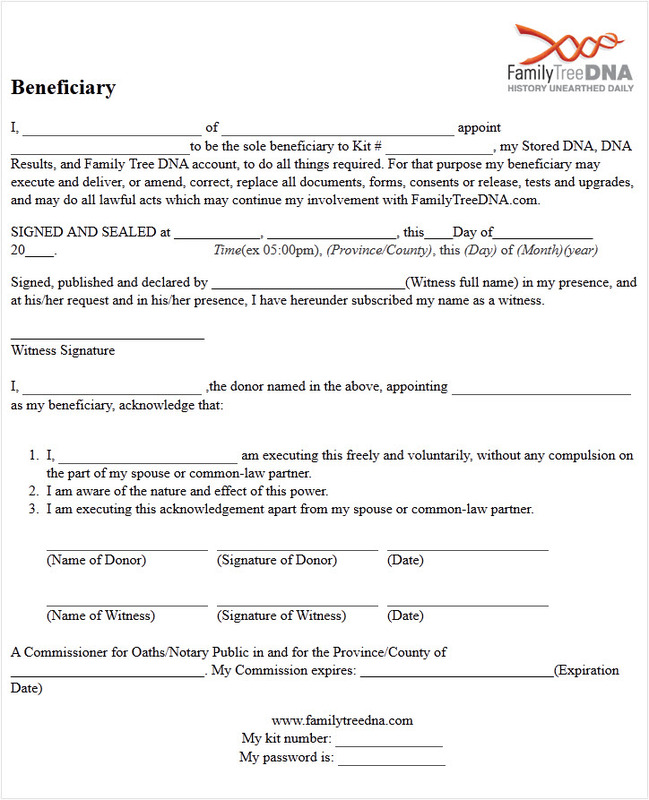 It’s particularly important to get the forms signed if, like me, you are the one who gathered up samples from other family members who gave you their verbal consent to manage and handle the kits for them. Managing those kits can be a bit like herding cats at the best of time: I use different email addresses for each kit so that inquiries related to each kit can be separated, I have six-generation charts for each one, I keep them informed of any breakthroughs we get as a family through DNA, and I check back with each person periodically to see if they’ve learned anything new to add to the paper trail and to ensure they’re happy with how I’m managing the kits. So far at least it’s worked well. But your cousins’ consent to share their results, the one sent to FTDNA with their test kits, doesn’t ensure that they won’t get hit by a bus. So you need to make sure they’ve done what’s needed in their lifetimes to ensure you don’t lose the ability to manage the kits — and that includes the ability to make sure that somebody is available to continue managing the kits if something happens to you. I’m adding a contingent beneficiary to my forms (“my beneficiary is so-and-so and if so-and-so isn’t available, then second so-and-so…”). I’m glad FTDNA are so upfront with the Beneficiary release form… most of us forget all the ways our kids will have to manage our genealogy work in all ways – on the web, off the web, DNA etc. Thanks for bringing up this very important point, Judy. A lot of us have grey hair and are getting more ‘mature’ – even though we might feel about 35 inside! Just thinking about the number of email addresses and websites I have to explain to the executor of my estate is mindboggling. And then all those DNA kits…! I paid for a cousin to do a 12 marker Y-DNA test some years ago. I was extraordinarily glad I did — and he did — because he was the last known male in that family line. He died 5 months later, an unexpected event at the time of his test. I have no idea who his ‘beneficiary’ is. I’m the email contact and the ‘person’ the company contacts regarding results. How do I find out if I’m his “official” beneficiary, because I didn’t even know there were such things. My goodness, Judy, I have enough trouble with the stuff I do know about — and now you’re bringing up things I was oblivious to. I don’t know whether to thank you or tear my hair. Or both! I’d vote for both. Why should I be the only one tearing my hair out??? As for how to find out if you’re the beneficiary, you’re not. The notion of a beneficiary didn’t exist when your cousin died. 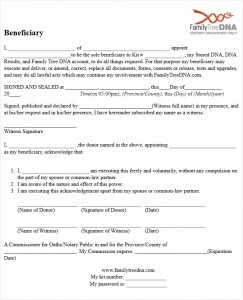 Since you have the kit info, you can enter yourself in the beneficiary info, but you’d need his heirs and/or legal representative to sign off. In your shoes, I wouldn’t change a thing until I was sure I could get the family to sign. I am very serious about this one: things are working for you right now in the relationship between that kit and FTDNA so don’t rock the boat. But to ensure that somebody else down the road can KEEP accessing the account, I sure would try to get his family to sign off.